DIY Kaaba Balloon – Hello Holy Days! 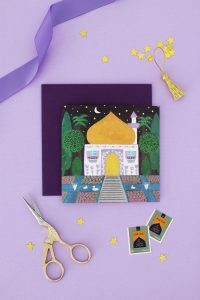 Many American Muslim moms like to use the Kaaba as a symbol to help their children understand that Eid al Adha marks the end of Hajj. 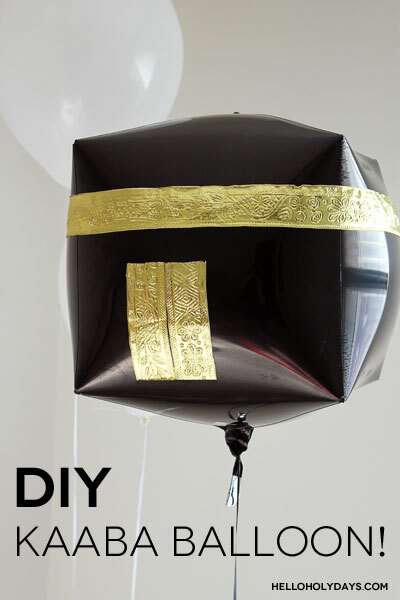 Balloons are always a good choice when celebrating any occasion with kids, so here is a super simple DIY to make a Kaaba balloon! Pair it with white latex balloons and you’ll have yourself a festive balloon bouquet to display on Eid! This DIY is also a keeper if you’re hosting a welcome home party for pilgrims. Attach a piece of double sided tape to one end of the ribbon and secure it near the top of the cube. Wrap the ribbon all the way around till you reach your starting point. Cut ribbon and secure with double sided tape. On one side of the cube, make the Kaaba door. Cut two pieces of ribbon in the same length and attach to the balloon side by side to make a door. Keep in mind the kaaba door is positioned to the left, not the centre.